I have come again to sit in the closet with you and share in our circle of thoughts, ideas, knowledge, & secrets in solidarity. I am very excited to be here again with you! This time in my Carpet Bag I’ve brought none other than a seasonal favorite for us all, Flowers!! What could be more beautiful, witchy, yet mundane then those? Everyone can use them, and we sure as heck need them! Many beautiful plants bloom through spring and summer into fall. If you are not a gardener and did not plant your own, that is fine, there are many home improvement shops with bright blooming flowers and local nurseries, as well. You can easily move these flowers into your own pots to make them even more lovely. Before we delve deeper into the meanings of plants let’s go into the way we can display these beauties. These are normal, everyday displays that do not bring attention to the witch. Now a Flower Window Box or Planters can be anything from a small box on your balcony filled with fragrant herbs to a potted plant on your window sill blooming with something bright and fragrant. Remember it is the room you have. It doesn’t have to be anything grand. It just has to be right for you! If you have a small garden outside you can put your Plants & Herbs in movable Planters and Pots to keep them safe from weather, making them easier to move about. Then, you can, also, move your scents about. If you have a pathway around your house, maybe leading to your backyard, or from your driveway, placing flowers along each side makes a fragrant walkway. Now if you like a bit more drama You can go for something like this, a Bower. They are quite stunning. They don’t scream witch either, just gardener. A nice fragrant hedge adds to the party, too. Now let’s get into the magick of some plants. This is where our fun begins. While everyone is admiring your beautiful garden you are thinking inside what all those uses are for those beauties. Sweet Pea: It attracts friends & Allies. It draws the loyalty & affections of others to you. Tulip: Because of the many colors and parts of Tulips, they can be used in many parts of magick. Here is a good link to some information Tulip Magic Legend and Folklore at Thought Co. Geranium: For overcoming negative thoughts & attitudes, lifting spirits, promoting protection & happiness. Repels insects. Balances mind and body. Hyacinth: It promotes peace of mind and peaceful sleep. Also, attracts love, luck, & good fortune. Named for Hiakinthos, Greek God of homosexual love, this is the patron herb for gay men. Guards against nightmares when used as an oil, burned as incense, or included in dream pillows. Carry in amulet or sachet to ease grief or the pain of childbirth. Freesia: Used in spells for love, peace, lust, pheromones, harmony, comfort. Datura: Datura is also known as jimsonweed and you can find some incredible information on Tess Whitehurst’s Site Live Your Magic. Lavender: It’s magickal uses include love, protection, healing, sleep, purification, and peace. It promotes healing from depression. Great in sleep pillows and bath spells. Believed to preserve chastity when mixed with rosemary. Burn the flowers to induce sleep and rest, then scatter the ashes around the home to bring peace and harmony. Use in love spells and sachets, especially those to attract men. Also known as, Spke, Nardus, Elf Leaf, & Nard. Rose: Magickal uses include divine love, close friendships, domestic peace/happiness, and lasting relationships. Great for use in incense, potpourri or bath magick. Place around sprains and dark bruises to help them heal faster. Narcissus: Calms vibrations and promotes harmony, tranquility, and peace of mind. Also known as, Asphodel, Daffy Down Lily, Fleur de Coucou, Goose Leek, Lent Lily, & Porillon. Violet: It calms the nerves, draws prophetic dreams and visions, stimulates creativity, and promotes peace & tranquility. Violet leaf provides protection from all evil. Violet crowns are said to cure headaches and bring sleep. Carry or give to newly married couples or new baby & mother to bring luck to the bearer. Keep a spray of violets on the altar to enhance night magick. Wear the leaves in a green sachet to help heal wounds and prevent evil spirits from making the wounds worse. Also called: Sweet Violet, Blue Violet, & Wild Violet. Lily of the Valley: Is soothing, calming, draws peace and tranquility, and repels negativity. Assists in empowering happiness and mental powers. Use in magickal workings to stop harassment. Married couples should plant Lily of the Valley in their first garden to promote longevity of the marriage. Note: Poisonous, use with caution. Also know as, Jacob’s Ladder, Male Lily, Our Lady’s Tears, Ladder-to-Heaven, May Lily, Constancy. Wisteria: It raises vibrations, promotes psychic opening, overcomes obstacles, and draws prosperity. Lilac: Wisdom, memory, good luck and spiritual aid. Also called: Common Lilac. Peony: For protection from hexes and jinxes. Good luck, good fortune, prosperity, and business success. Hang in the home or car for protection. Used to attract faeries. Use in rituals to cure or reduce lunacy. Warning: While the flowers & petals have the positive qualities listed, the seed is called ‘Jumby Bean’ and is known for promoting dissension and strife. Honeysuckle: It draws money, success, and quick abundance; Aids persuasiveness and confidence, sharpens intuition. Ring green candles with honeysuckle flowers or use honeysuckle in charms & sachets to attract money. Crush the flowers and rub into the forehead to enhance psychic powers. Also Called: Woodbine, Jin Yin Hua, Dutch Honeysuckle, Goat’s Leaf. Now remember, these are just a few!! There are so many flowers out there with magickal uses, those without scents, like ferns for instance!!! They are good for mental clarity, cleansing, purification, and dispelling negativity. Keep them in your room where studying is done to help concentration. Burn a sprig of fern before an exam. Use in sachets and amulets for powerful auric protection. Now did you know that??? There are ways to bring flowers into the home for those of us allergic to flowers, without green thumbs, or who just like to craft. If you are not allergic and are just like to create or lack a green thumb you can add essential oils to the following creations. There are so many more tutorials on YouTube for different types & sizes of flowers made from a variety of different materials. You can really have some run. This is the easy part. Flowers can be brought into your craft in many simple ways that will not bring attention to the witch. You can simply wear one in your hair. I’m not even talking about the headband crowns that are popular these days, but a single one behind the ear is fine. Say, a simple violet to calm the nerves. There is nothing wrong with a vase of fresh cut flowers or even planted flowers around the home. How about a nice bowl of floral pot potpourri? Sachets for your drawers & closets? There are garden/seed growing kits in stores made for specific reasons. This one gives you all you need to grow yourself lavender and then turn it into a facial scrub! How relaxing is that for a nice Witch Spa Day! All of these can be mixed into mojo bags and witchy doings. It’s all in the eye of the Magick Maker. I bid you farewell for now in this aromatic jungle of ideas. About Devil Worship, Flying Besoms and Such. Or Not? Ever since I took my first steps on the pagan path I have been open about it. I’ve never really been in the broom closet. I don’t walk around brandishing it to everyone, but I don’t hide it. Being pagan is an integrated part of me; you can’t separate the witch from the woman, they’re one. I’ve never felt like hiding it, why should I? Of course I’ve had mixed reactions, but most of it was positive or neutral. People don’t have to like it, as long as they respect it. Nowadays people know more about modern witchcraft, thanks to the internet and media. They don’t always give the best explanation about it, but at least it’s known to more people. Years ago, before the internet started to become what it is today, I encountered much more prejudice. Not always meant in a malicious way, but often from simple ignorance. So how do you explain paganism and witchcraft to non-pagans who don’t know anything about the lifestyle, the religion, the path? The misconceptions are a good starter point. I explain that witches don’t even believe in the devil, and how the pagan god became the christian devil. Or I start with the broom or besom and explain what that is really used for. Then it’s only a small step to what I do believe in. It depends on the person how I proceed. Are they really interested or just making conversation? The last one isn’t interested in an extensive explanation, the first might be. What is their background? If I know something about their religion for example, I try to build bridges, find comparisons. If I don’t know anything about them, I simply ask what they know or think about paganism. It’s never my goal to convince anyone, I just try to explain. I don’t proselytize, no need to convert anyone. If someone is interested and wants to learn, that’s fine of course. If the initiative is on their side I’m happy to help any way I can. As I said before I’m open about my path. In real life and online. I’ve written about it on my blog and on social media. Sometimes informative (to explain a sabbat, or tools I use, etc. ) but often just sharing what I do. I share pics and stories about pagan meetings, about rituals, festivals, books I’ve read and the like. I show people the way I live and how paganism is part of that. That resulted in most people simply accepting it as it is. She is a witch, okay, move on. And that’s okay. If you’re not interested in that part of my life, no problem. If you have questions, please ask! Stupid questions don’t exist and I’m happy to explain what you want t know. Last year a dear friend asked my help in understanding the witches’ ways for a very different cause. She was writing a book in which the protagonists are witches. She wanted to know about things in general and ask some practical questions. Of course I was happy to oblige! Her name is Claudia Hall Christian and she has written several successful books. I got to know Claudia when I started blogging, before the social media era. We read each other’s blogs and I helped her before in promoting her books. This time I could do more to help her. I answered her questions and showed her the best sources about wicca, witchcraft and paganism in general. She also read stuff on my blog and my columns here in Pagan Pages. Of course I was not the only one she consulted. As always, her research was extensive and thorough. “They call her “Em.” Em for Martha. Em for “Emogene Peres” the name she received in Boston less than a day after she’d been hanged in Salem Village in September 1692. Em and most of those hanged as Salem Witches were transformed into immortal witches only a few hours after they were deemed Salem Witches. Three hundred and twenty-two years later, they live, work, and love in modern day Boston, Massachusetts where Em runs a spiritual store called the Mystic Divine, just off the Boston Commons. Claudia will also write a guest post on my blog. I’ll add the link at the end. She was kind enough to offer a copy of the book for a blog contest. 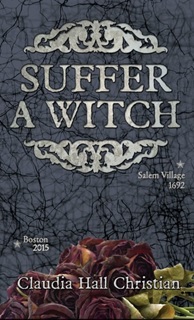 So come on over and take your chance to win ‘Suffer A Witch’. We’ll also give you links to order the paperback or e-book. When you’ve read the book, Claudia and I would love to hear your feedback. 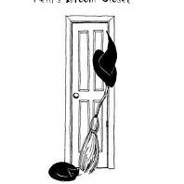 One of the major discussions among Pagan groups is whether or not to be in ‘the broom closet’. This is reference to a person being open about their Pagan beliefs to others, including their friends, family, co-workers, or the general public. It’s a touchy subject, which many Pagans have strong opinions about. Coming out of the broom closet can lead to broken relationships if the person receiving the news feels strongly against your Pagan beliefs. Some Pagans refuse to be open about their religious beliefs for fear of persecution or judgement by their friends or co-workers. Some Pagans feel that this persecution could go so far as being fired from a job or being disowned by family members. However ‘coming clean’ about your Pagan beliefs can also be cathartic. Even though one side of the Witches’ Pyramid is ‘To Be Silent’, that doesn’t necessarily mean hiding who you are. Admitting to others what your beliefs are can lead to some surprising results, including finding support from places you did not expect. It can also help you accept yourself and your chosen path, especially if you have struggled to understand why you have been drawn to your current path and where it might lead you. One way to decide whether or not to share your Pagan beliefs with others is to ask yourself what you might gain and what you might lose if you do so. If the benefits outweigh the repercussions, it might be a good time to consider being honest about your Pagan views. Also, admitting you’re a Pagan for shock value or to upset people is never a good reason to come out of the broom closet. Coming out could be as easy as telling your friends or family that you’re a Pagan. Naturally there will be questions, so be armed with answers you feel comfortable talking about and that you feel accurately represent your Pagan beliefs and Paganism as a whole. Be prepared for silly or offensive questions, for example, concerns about Satan or Hell. But try not to judge the people asking those questions. Misconceptions about Pagans, Wiccans and witches are very common due to popular media, and outsiders can find it hard to discern between truth and myth. Whether you are “in” or “out” of the broom closet, it is still a personal choice that can only be made by yourself. Nobody has the right to share your beliefs with others without your express permission. Religion is a personal choice and it’s up to you whether or not you want to share your Pagan beliefs with others. I’m pretty rash about most things. I get an idea and I’m gone. Even if that idea might only last for a little while, while I have it, it’s my world. So it’s a little surprising that I’m taking my time with paganism. I dip my toes in, then I step back. I read lots of books, and then I take a break from books. This works for me because paganism isn’t going anywhere. It’s a constant for me to dance around as I learn more about myself and my place within it and within the world. Sometimes the dance is fast, sometimes slow. I’ve been dancing like this for about three years and I’m in no rush. I’ve only begun to interact with other pagans much over the past year and in doing so, I’ve noticed something. A lot of the people I come into contact with are new to paganism. Like, a couple of months new. Their Facebook posts declare that they were born to be Wiccan. They proudly proclaim how amazing it is to be a witch. A witch? It’s one of those words that widens the eyes of outsiders the most, yet it’s an identifier that many in the pagan community have come to embrace positively. It has come to have some spiritual significance to me, as well as to many other pagans and Wiccans. The word “witch,” no matter what differing definitions you run into, generally denotes involvement with magick. And to me, it signifies some degree of mastery. Hell, at least a little. But if you just learned about paganism and you’re still afraid of doing magick ’cause you don’t want to screw it up, what does it even mean to be called a “witch”? I’ve come to treat the title of “witch” as a sort of honor. That’s why I don’t call myself one, and why my blog is aptly titled Witchy Wannabe. The title is one I’ll bestow on myself with dignity when I’ve reached a milestone I’ve set and diligently worked toward. If you’re in a coven or group, that marker might be set for you. But if not? I encourage you to consider what that marker could be for yourself. And I encourage you to think twice before using the title “witch” if you’re not really there yet. In Wicca, there is a traditional period of a year and a day over which one studies before being initiated. Typically, one “dedicates” themselves to this period of study, making a commitment before the gods. Some people also dedicate themselves to Wicca or the gods at this point, but I personally think that it makes the most sense to hold off on dedicating oneself to the God and Goddess and Wicca until that year and a day is complete and you are in a better position to make that commitment. Considering whether you’re ready to dedicate yourself to either a year and a day or to Wicca is important because the more we commit to things that we don’t follow through on, the weaker our will and our word becomes. Over time, we come to know that saying something is so doesn’t make it so, and we can’t have that because it makes for weak magick. So make sure you only make commitments you are pretty sure you’ll be able to keep. That way, when you say “So mote it be,” both you and the universe will know your word is solid. To get an idea of how you could set up your year and a day, head over to The Witch’s Voice and check out the article “Before You Call Yourself a Witch.” The author offers up a helpful list of things she thinks one should achieve before they take on the title. Committing to a year and a day doesn’t mean that at the end of that time you’ll be amazing at all things magickal and witchy. The idea isn’t to achieve mastery during that year, but to get a good start on what can turn into a lifetime of learning. The successful completion of that time also shows that you’re serious about the path you’re on. Though I’ve been pagan for a while, I’ve sort of saved my year and a day. I’ve kept it in the back of my mind, planning on doing it eventually, but knowing myself enough to know that I can be fickle. I wanted to wait until I’d be serious about it, and even though I’m not exactly just starting out anymore, I want to complete that official year and a day for myself because, if I can maintain that sort of commitment to my path, then that means something to me. This issue might seem to necessarily raise the question of just who is a witch and who isn’t. Who is to judge that? As is so often the case in paganism, I think the answer is that it is the place of each and every one of us to search that out for ourselves. I am not encouraging the constant critiquing and judgment of others, and I’m not suggesting that being a witch is some instant mystical transformation that either is or isn’t. I’m just suggesting that we think about what the word really means to us before using it so that it doesn’t become just another empty word. Not feeling ready to use the title is nothing to be ashamed of and it doesn’t make anyone inferior to anyone else. After all, we’re all filled with power. As Glinda the Good Witch said to Dorothy, “You’ve always had the power, my dear. You’ve had it all along.” Being a witch isn’t just about having the power, though. It’s about knowing what to do with it, and that only comes with time. I’m “in the broom closet”. It’s one of the most frustrating and difficult parts of being Pagan for me. I live in the United States and I have rights and freedoms to practice my beliefs as I wish. But, when it comes to being Pagan, there are consequences for being open and public about it. We can easily find a story in the news about a Pagan woman losing her right to see her children, someone losing their job or passed over for a promotion, someone’s home being vandalized or threatened, or children being teased or ridiculed for their parent’s beliefs. It isn’t fair. The alternative of practicing privately isn’t any better – lying to family and friends (including spouses in many cases), using fake names (both online and in person), and avoiding cameras at Pagan gatherings and events – just to name a few. I also know it’s why some people don’t show at my group’s events. Like many others, I’ve spent a considerable amount of time thinking about coming out and how I would do it (many seem to post it to their Facebook page). I’ve mentally prepared myself for what questions I might be asked and how I would answer them. I’ve tried to think about who might have a problem with it, how my relationships with those I care about would be affected. Most importantly, I think about how they will treat my family – my wife and kids. What I usually decide, however, is I’m not sure it’s necessary for me to come out. Although I have the utmost respect for those that have come out of the broom closet, my goals are simpler. I’m not interested in making sure everyone I know finds out I’m Pagan. What I hope for is to simply be able to practice openly; to stop hiding it. It’s a small distinction but it’s what’s important to me. I’m generally very private about my beliefs anyway. There are times, though, when I feel so connected to this path, times it brings me so much peace. Those are times I want to share it. But, I know I can’t, at least not with everyone. Not everyone will react in a positive way. They won’t be able to see past what they don’t understand. They won’t see what I see, feel how I feel. They haven’t taken the steps outside themselves, of what they know; the steps those of us who have traveled on another path know very well. By opening up to them I would have an opportunity to educate them, to show them. This breeds understanding and, eventually, maybe even acceptance. By opening up to them we eventually make it easier for others to follow. This ends up helping our community. Interestingly enough, since I’ve started on this path, only one person has ever asked me about my beliefs. That person, a friend of mine, noticed something I posted online and asked me about it. He found it interesting and was very supportive. I suspect others also know – we’re not as good at hiding something as we think we are. As hard as it can be, I believe living out in the open is good for us and helps our community. I’m working on this. I know that as I become more open I have a family and a community that supports me, both online and in person. The signpost for me is I don’t need to shout out to the world “Hey! Look at me! I’m Pagan! Deal with it!”. I just want to be able to practice my faith the way I feel called to do so. Are you in the broom closet? If so, do you feel a call to come out? If you’re out, how have friends, family and the rest of society treated you? If there is one thing the Pagan community has in common with the GLBT community it is being stuck in “the closet.” It still amazes me how many Pagans I meet who are struggling with coming out about their Paganism and witchcraft practices. I know their pain all too well. I am still in the broom closet with my immediate family. My family is super Conservative Christian and they have made it clear that if I even show an interest in Wicca or anything like “that” I will be disowned. It is extremely painful to hear your parents say that. I am still struggling with whether or not to come out to them. On one hand I want to be completely honest with them, to be true to myself and to be proud of my beliefs. On the other hand though, I do not know if I am ready to be completely cut off from my entire family. I already lost all of my aunts, uncles, and cousins when I married my non-Christian husband. My mother, father, and brother are all I have left on my side of the family. It is definitely a tough decision and one I stress about all the time. I feel like I am betraying myself and my Deities every time I hide my altar tools when my parents come to visit. For now that is what I choose to do though, even if it causes me pain, but I know that someday I will not have to do that. Someday I will be completely out of the broom closet! I do not know when that day will be, but I do know that at least it is my choice when that day will be. When coming out of the broom closet it is important to remember that every person’s circumstances are unique. What worked for one person may not work for another person. Every Pagan has to come out of the broom closet at their own pace, in their own way, and in their own time! I may not be completely out of the broom closet yet, but I have learned some good tips along the way. Tip number one: never be completely one hundred percent in your broom closet and never be alone in there. Humans are social animals we need to feel loved and accepted. If you are not able to come out to your friends or family, at least find one person you can share your Pagan beliefs with. The internet has become a great resource for many Pagans. Find a Pagan online friend, set up a secret Pagan blog, or have an openly Pagan social network account (like Facebook) under a false name. Bottom line you need to have at least one Pagan shoulder to cry on, so to speak. Tip number two: if you cannot come out to your family find someone (or somewhere) that you can come out to in person. While online Pagan friends are a great resource there is just something freeing about telling someone in person that you are Pagan. Find a local meetup group that is Pagan friendly, come out to your co-workers, tell your yoga instructor, or tell the random cashier the next time you are paying at a store. It does not matter necessarily who you tell the point is to just tell someone. Think of it as practice. Practice coming out of the broom closet to strangers and someday when you come out to your family it will be much easier. I can tell you from personal experience that all of these tips and ideas do work. I am still in the broom closet with my parents, but that does not mean I am in the closet with everyone else. My husband and his entire family know I am a practicing Pagan and witch. I am completely out of the closet at my work as well, in fact, I am an ambassador for the Pagan community at my job. I am in charge of running the Pagan booth and events on our diversity days at work. It is really fun and such a nice feeling to know I am making a difference for my Pagan community, even if my parents do not know what I am up to. I am an avid Pagan blogger, writer, and have a whole support system of Pagan friends online and in my local community. I may be in the broom closet still, but I am definitely not lonely in there! I am slowly making my way out of my broom closet, even if it is only one foot at a time! Should Children Remain in the Broom Closet? I am certain that I am raising my children in the way that is most beneficial for them. I believe that children need to be taught spirituality from a young age and it should be the same beliefs that are held in their home; for us that spirituality is Eclectic Wicca. We practice our faith daily and interact openly with other pagans within our community. I am “out of the broom closet” as I run a home based business that is centered around our beliefs. My children are aware of what I do and will speak about “Mommy’s Tarot Reading business” as easily as their peers speak of their parents’ careers. My children do so without exaggeration, without the spectacular descriptions one might expect them to use when describing Hollywood magic. Instead they discuss it in the same terms that they would discuss what a teacher or a doctor does in their respective jobs; for them there is no difference between the magickal and the mundane. I do not force any spiritual path on my children. It is something that just ‘is’ in our home. Wicca, because of its nature, cannot be forced taught. Unlike many other religions we have no threats to make nor do we have punishments to promise. Our spirituality embraces respect for life and the sacred being that resides within every living creature. In respecting our children’s sacred self, we respect the God/dess. Our beliefs embrace accountability for one’s actions and mistakes however, these things do not make us unlovable to deity. Wicca is a way of living. It is our moral code which incorporates virtues I wish to instill in my children. Virtues such as: balance, creativity, empathy, honesty, modesty, open-mindedness, perseverance and respect. I encourage my children to be respectful of other’s beliefs and to understand that there is more than one way to worship the God/dess. No one way is ‘the right way’ nor ‘the only way’. Not even our way. Because of this my children will occasionally attend a Christian Service or an Event with their biological father and his girlfriend. My eight year old daughter has attended Sunday school at their Church. I embrace these insistences for they open the door to different points of view for my daughter. After attending she will often ask questions and come to new understandings concerning deity on her own. My twelve year old son will engage in discussion with my husband and me about Jesus Christ after going to a Christian Service. He clearly contemplates new ideas and concepts after a meaningful spiritual conversation with us. I never want my children to be ashamed of our spiritual path so I do not encourage them to be silent nor do I encourage them to boast. I imagine that some fellow Wiccans might argue against my thoughts quoting the Witch’s Pyramid to “Keep Silent”. While I embrace The Witch’s Pyramid as well, I don’t see this particular tenet applying to our situation. It is my belief that this point of the pentacle discusses: how a witch should never boast or brag about what magicks s/he has done, will think before speaking, will not intentionally harm others with her/his words, will never gossip nor disclose where or what took place inside a Magick Circle. These ideas are important and I teach them to my children as we travel the Wiccan path together however, I do not feel that “keeping silent” about our spirituality benefits them. This doesn’t mean my point of view will never change. We live on the East Coast in a state that has liberal views when it comes to religion. I haven’t encountered many negative interactions with people when they find out I am Wiccan. Instead I find people are curious and will share bits of information they came across from others asking if it is valid or fiction. I am not afraid of ridicule or bigotry against myself or my children because of our spirituality. I would consider my children to be “out of the broom closet”. My son last year did a school project on Wicca for his social studies class when they covered world religions. He answered questions thoughtfully, intelligently and without fear. My daughter who attends first grade at the local public elementary school will often have friends over to play. When she is questioned she will comfortably and easily explain what each item on our altar represents or why there are candles and incense burning. She is quick to stop a neighborhood child from stepping on a snail in our yard explaining that it is Mommy’s friend and the Goddess will be unhappy if they were to kill it. Is our way the correct way for all Wiccan families? No. I would never claim that to be so. Should all children be so open about their spiritual path? The answer to that is for each set of parents to consider. For us, for now … this is what works best. Bright Blessings! Being in the broom closet is not a comfortable place to be. There’s too much old stuff hanging around, it’s far too small and it smells a little like mothballs. I’m not in the closet but there was a time when I couldn’t be my authentic self. I was far too worried that my friends wouldn’t be my friends anymore, my family would consider me weird and my then husband would ridicule me. It turned out I was right on all accounts. When you’re not living life how you feel you should be, you’re not being your authentic self. It crushes your spirit and often depression isn’t very far behind. Living in the fear of what other people think, especially those closest to you, because you’re not a mainstream, cookie cutter clone is an invite to major stress. Often the fears are unfounded and loved ones love us unconditionally. I went through a divorce which altered my life completely. I realised I had to be me, take back control of situations that I’d allowed to get horrendously out of control and pursue life on my terms. It wasn’t easy and at times it was excruciating painful. I lost everything I knew including my parents and brother. Cut off, gone from their lives as if I never existed. And yet there is a quietness and a peace to be found when old relationships, however permanent they’d been in your life, dissolve and you’re free to find new ones that suit you. You learn about yourself because you’re forced to grow and develop. It’s true what they say about the Universe detesting voids – sooner of later you fill the gaps that were left behind with new and wondrous things. And most importantly you know you will never, ever fit in a broom closet again.